MUST BE SEEN! – PRIVATE ENTRANCE – TWO BEDROOMS – SHARED GARDEN – ALLOCATED PARKING – Quarters are delighted to offer for sale this two bedroom ground floor maisonette located on this popular modern development. The property is presented to the market in excellent order with accommodation comprising: Entrance hall, kitchen/lounge/diner, inner hallway, two bedrooms and a bathroom. Additional benefits include double glazing, gas heating, allocated parking for one car and a shared rear garden. Viewing is highly recommended. Single panel radiator. Storage cupboard. Doors to all rooms. Double glazed window to rear aspect. Single panel radiator. Television point. Built in wardrobes. Double glazed window to side aspect. Single panel radiator. Storage cupboard containing central heating boiler. Double glazed window to rear aspect. Single panel radiator. Fitted suite comprising: Low level WC, panel bath with shower over. Tiling to water sensitive areas. Recessed lighting. Paved path leading to front door. 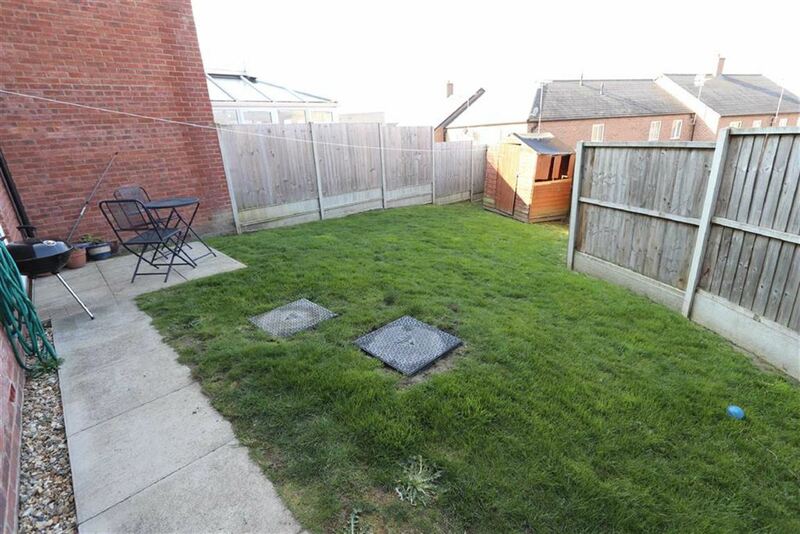 Enclosed rear garden with patio area and remainder laid to lawn. Timber shed.